Unique and scenic rock formations are always a must-do along our travels in the west. 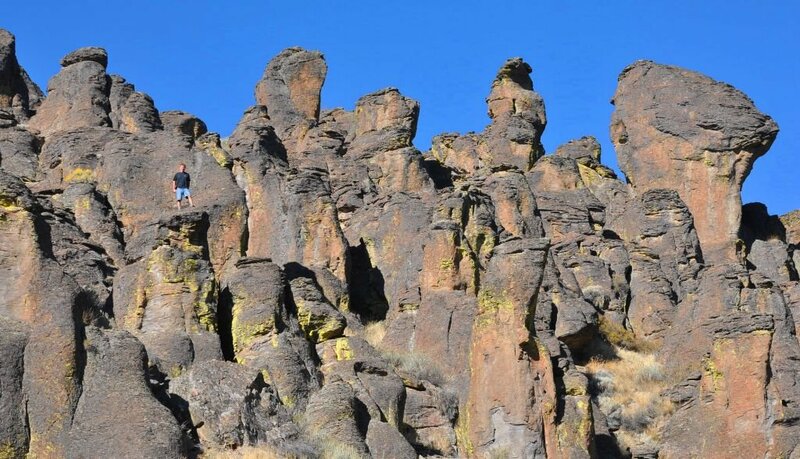 One such place is the Little City of Rocks located near Gooding, Idaho. 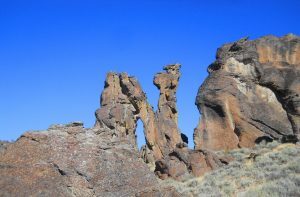 The Little City of Rocks (not to be confused with “City of Rocks” in Southern Idaho) features thousands of acres of rock formations including towers, mushroom caps, hoodoos, natural arches, and spires. Plan to spend a couple of hours wandering through the area. If you are traveling with children, add another hour or so as there are many nooks and crannies for them to explore. 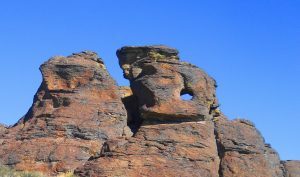 Geocachers will enjoy searching for the multitude of geocaches stashed in the area, while those that enjoy Native American history will want to seek out petroglyphs hidden among the rock formations. Photographers will likely want to boondock in the area, so they can take advantage of the Golden Hour to capture the most dramatic shots. While websites advertise the main loop trail, it is easiest to just pick one of the many side trails that wind among the rocks and create a loop. The parking area/trailhead is located about two miles down a graded dirt road suitable for most vehicles. The area is under the jurisdiction of the BLM, standard BLM dispersed camping (aka boondocking) rules apply. Keep in mind that rattlesnakes may be present in the warmer months. If you do not wish to boondock in the City of Rocks, there is an inexpensive campground not too far away on the northern outskirts of Gooding. The Big Wood River RV Park is operated by the City of Gooding. Most sites are pull-thru water and electric sites with BBQ stands. A free dump station is located in Gooding on the 200 block of 2nd Ave W.
Exploring the Little City of Rocks, just another adventure in RVing!